What happens if a PROVIDER joins a provider network such as a CIGNA HMO or PHCS PPO or BC/BS HMO? Answer: The provider has agreed on “negotiated” pricing for patients with a health plan using those networks. FACT: Negotiated rates paid by YOUR HEALTH PLAN to doctors are sometimes more than the cash price the same doctor might charge someone without a health plan. Have you met your deductible? If not, it MAY BE BETTER to hide the fact that you have a health plan and just pay the cash price. QUESTION: Is this legal? What could happen if the doctor finds out your “strategy”? Of course, it’s NOT ILLEGAL for you to not use the insurance you have. However, on this particular “strategy” issue, I have received interesting feedback over the years. On several occasions I have been told that someone tried to get the cash price after they have given their insurance information, only to be told by the doctor’s billing department that they are required to charge the negotiated rate. Unfortunately, this is true, even though the patient will likely be paying more than the cash price. LIFE LESSON: (Using a PPO network as an example) Once you give a doctor’s office the ID card for your health plan, they are contractually obligated to charge you the rate they agreed to for that PPO and cannot offer the cash price. AWKWARD MOMENT: What happens if the doctor’s office finds out later that you have a health plan and it supports a PPO/HMO that the doctor has joined? 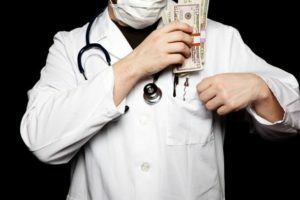 Will the doctor go back and have to re-price all the past bills and submit them to the PPO/HMO? There are so many different answers to this I will not pretend to know the correct one. It will vary depending on your doctors mindset, or more accurately, their personality type. How about this – YOU TELL ME. I’d be interested in hearing any experiences anybody has had with this scenario.